Here we go again, another Nor’easter is on its way. As I sit here dreaming about warmer temperatures (hopefully soon), I wanted to reflect back to a vacation I took in late December. In the past, my husband and I have stayed local for the holiday season. But last December was different. We needed a break from the cold and Nor’easters that the east coast is known for during the winter. So, we decided to pack our bags and head to the friendly southwestern state of Arizona. Arizona is my first home. I was born in Phoenix and lived there up until grade school. Being a typical kid/pre-teenager, I took the Arizona weather for granted. Sure, some say the summers are brutal, but I never had to worry about layers and layers of clothing to keep me warm in the winter. I also had a total disregard for the beauty of Arizona. For instances, the Grand Canyon was right in my backyard. Quite the site if you have not seen it up close and personal. Also, very close by are the Antelope Canyon – I really wanted to swing that in this trip, but we ran out of time. And Flagstaff was a quick two hours from home. I guess it takes growing up to really appreciate what you have in front of you. 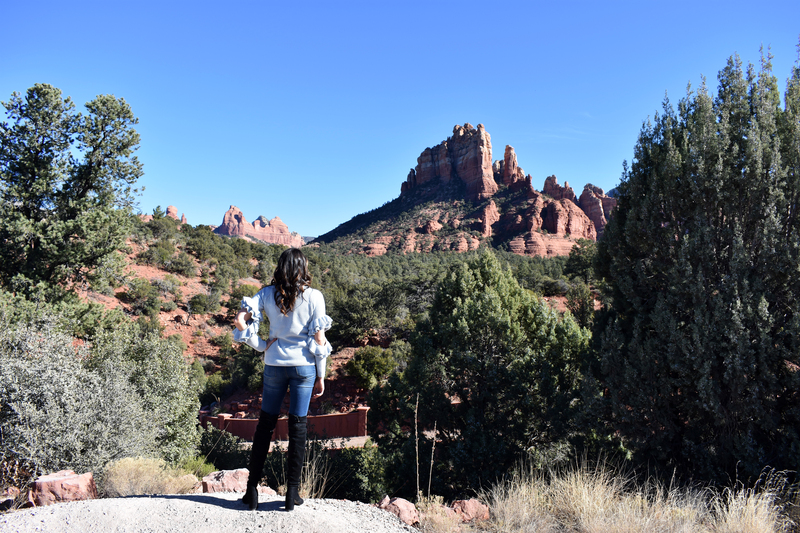 Our December vacation to Arizona was primarily spent in Flagstaff (home of the Great Pinecone Drop) but we spent a lot of time around the Sedona area. Sedona was lovely, and I cannot wait to go back and take on some additional adventures we weren’t able to get to during our trip. We started our trip with a drive to Sedona, where I found myself staring out the car window just in awe of the landscape. I highly recommend taking the scenic route and not the major highway. And the weather was perfect – low 60s during the day and not a cloud in the sky during the morning and afternoon. Sedona is famous for a lot of things, but for this trip, we focused on the vineyards (as this isn’t their busy time of year). We stopped at a handful of some of their best wineries, including Page Springs Vineyard & Cellars, Arizona Stronghold, Alcantara Vineyards & Winery, Javelina Leap Winery, and Caduceus Cellars. Each winery had their own unique twist, and all were very, very good…so much so that I can’t pick my favorite winery or wine. Since you have to be an Arizona resident to partake in their wine club, the only way to truly experience it as a non-local is to venture in person. No matter which winery you pick, you will have a fabulous experience and enjoy great, quality wine. How can I talk about Sedona and not talk about the shopping? Well, I can’t! Sedona has a wonderful variety of boutiques and markets. You name it they have it: dress stores, olive oil stores, hats, socks, art galleries, and more. It was a fashion bloggers dream! One of my favorite boutiques was Just Us Girls. I’ll have more details about them in an upcoming blog post, but their clothing and jewelry were perfect additions to my wardrobe. I loved everything I saw! We also ventured to VomFass home of amazing oils, vinegar, spirits and gourmet food. It was difficult to choose which olive oil blend I wanted to bring home with me (they do offer instore shipping, which is genius!). The selection I decided the infused olive oil with basil and garlic. I even ordered a few bottles for my friends! You can purchase a variety of sizes and if you cannot choose, they also offer gift size with a small sampling of each one. We never had a bad meal either. When you head into Sedona, be sure to check out The Hudson. If you are a foodie, this is the place to dine. Not only is the food fabulous, but they have the best seats in the city. They are known for having the best deck in town where you can take in the view and even a sunset or two. I wish it was a bit warmer, so I could sit on the deck, but even sitting inside, I still had a breathtaking view. Our week in Sedona was one of my favorite vacations. I got to see a lot of my family and soak in some much-needed sun. I highly recommend that you make Sedona your next trip. It’s fun for everyone because there’s so much to do there. And if you live in Philly, it’s a good escape from the harsh winters. Have you been to Sedona or any other part of Arizona? What’s your favorite part? What Are We Putting in Our Coffee? Empowering In Heels is more than a blog – it’s a fashion, and lifestyle community for all the powerful women (and men) in the world. I'm a passionate professionals! I live life to the fullest and conquer obstacles in front of me with an unparalleled class. I'm a life-long learner obsessed with providing the most relevant and robust content to my avid fan base.